Living in a half-acre paradise smack in the middle of town has its perks. The ten years we have spent on our section have been quite productive though some would say we have made more mess than we have cleared. The property had once been owned by a garden aficionado – this I know because we have all sorts of bulbs and perennials popping up all over the place. However before we became the caregivers of this plot of land, the place had been rented out for some time. As a result of garden-ignorant students and a goat-loving family, when we first moved in we thought the garden ended at the lemon tree. A poorly lemon tree which had had its under-branches trimmed to goat-reaching height. We started to clear some of the scrub and found an extra couple of metres of section and a ramshackle old shed underneath years of growth of invasive vines. We also discovered a large tangelo tree – I am not sure how that escaped our notice when we looked over the back yard prior to purchasing the place but perhaps the car wreck that was parked beneath it took our eye. Luckily we didn’t inherit the goat nor the wreck. As both the Anster and I are earth conscious, we have decided not to spray the invasive vines and opted to pull them out. This hasn’t been the most successful of options as ten years later I am still spending far more time than I’d like pulling out pesky old man’s beard, climbing asparagus, convolvulus, cleaver, ivy and at least two other irritating vines. I haven’t yet decided if the vines are a worse earth enemy than the pesticide but that is a soap box I won’t be climbing on to. The garden pests are not perks – rather anti-perks, de-perks?? Something like that anyhow. One of the better perks is we have plenty of room to indulge our orchardist yearnings with obscure and vintage apple trees (had to sneak some apples in somewhere). Another other is chickens. I have wanted chickens for years and years but we tore down the ramshackle old shed down the back before it blew over in a strong wind and took out the neighbours windows. Finally, after many chicken-less years, we have a lovely new chicken pen, complete with the toilet door from the original house (it still has the lovely toilet sign on the affixed to the door – maybe that is why the chickens won’t roost in there!). 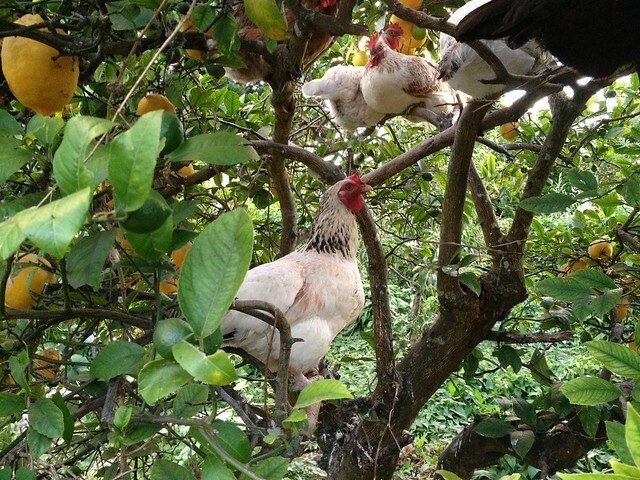 We put in some lovely tree branch roosts and plenty of shredded paper to keep the mess and smell to a minimum, but the chickens favour roosting in the afore-mentioned lemon tree (which has recovered well from the goat pruning). We also have a fence around the chicken pen but with all the vines growing over the fence it pulls it down to a height the chickens are able to fly over. So the gate is permanently open and the chickens are free to roam the section. 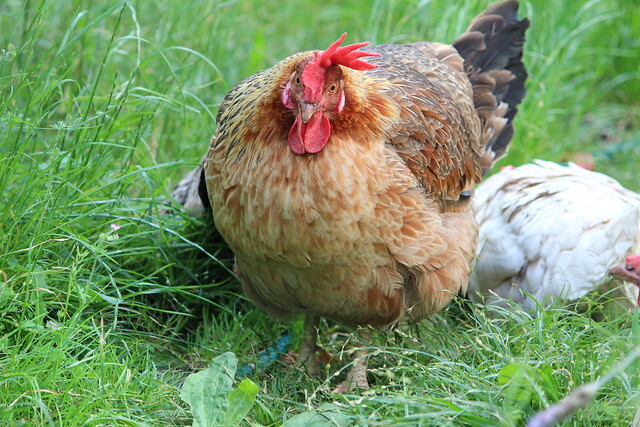 I love weeding the garden and having the chickens follow me around pecking over the freshly turned dirt. I don’t so much enjoy them pooping on the deck and I get quite cross with them scratching out my laboriously planted camomile seedlings (however not cross enough to shut them in their pen). 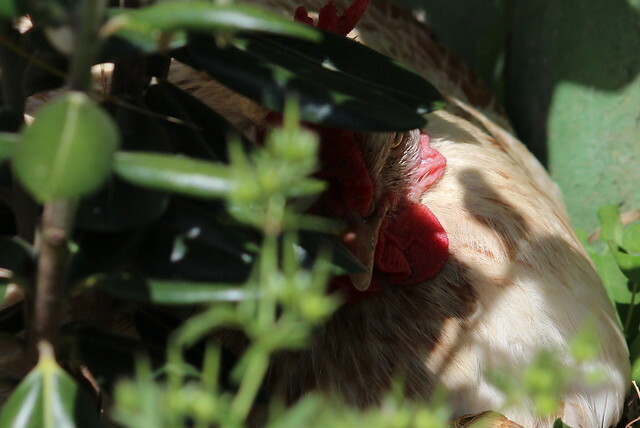 The trouble with free-ranging chickens is neighbours predator cats and sneaky hens hiding their eggs. We have learned to interpret the chicken alarms and respond accordingly. A six a.m. shrill clucking from here then there, then 300 metres down the road is the sound of the chickens being chased by a very bothersome tabby cat. We have trained our other animals to chase the tabby cat away, but that early in the morning our cats are reluctant to leave their warm cosy sleeping spots so it is either me or the Anster that gets up to do any cat chasing. Hopefully we are in time to prevent the chicken from escaping under the gate and disappearing into the neighbour’s garden – though if it is their cat, a noisy chicken can be their punishment. An ouch kind of sounding alarm usually means an egg has been laid. I haven’t yet decided if the chicken is saying ‘ouch, that really hurt’ or telling all her fellow hens ‘huh, look at that, I made an egg’. Anyway, when I hear that noise it is a race between me and Skippy, our big dog, to get to the egg first. 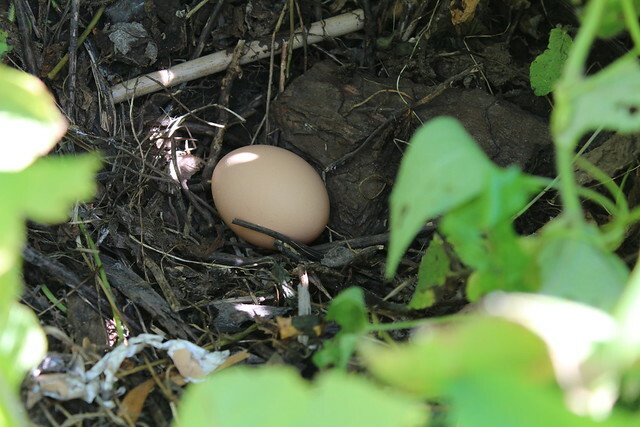 Sometimes despite my searching underneath piles of vines and heaps of wild bronze fennel, the egg remains invisible until later in the day I find a tidy little pile of crushed egg-shell. The dog obviously has a better nose than I. And sometimes I think the chooks just likes to give a false alarm – maybe they like to see me coming running and think ‘silly chook’ right back at me. Having rushed outside this morning, a young brown chicken was busy squawking her beak off while standing in the middle of a very weedy vegetable patch. I couldn’t find any eggs in her nearby vicinity but I did check a nest I found a few days ago. Sure enough, a nice brown egg. 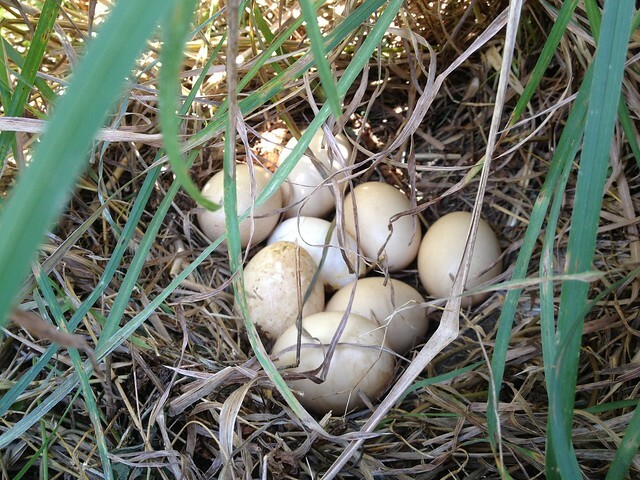 I know it wasn’t hers though – my brown chooks lay ivory coloured eggs and the white chooks lay caramel coloured eggs. Maybe she found the egg and decided to tell me about it before Skippy ate it. That’ll be it – I will have to go and reward her with some nice stale baking – maybe some of the Coconut Caramel Honey Slice that was a dismal failure. And lastly there is general very noisy chook noise. If it continues more than six seconds, the cacophony drives the Anster batty. So I traipse outside and give the offending chook a good talking too. Sometimes I have to tell them they aren’t roosters so stop trying to sound like one. Maybe they’re just broadcasting to their neighbourhood feathered friends just how good life is on our weedy half-acre paradise. 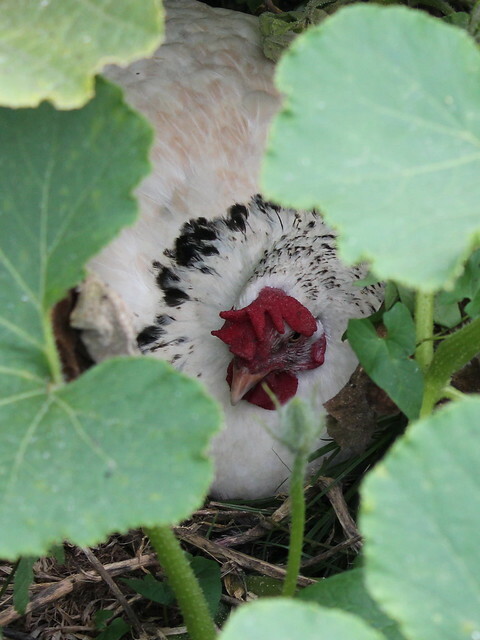 This entry was posted in Gisborne Life and tagged chickens, chooks, eggs by Jo Dohrman. Bookmark the permalink. Thanks, I feel like the chickens add a rural-ness to our place that makes it seem more like a lifestyle block than surrounded by neighbours on all sides.